I have been familiar with Farrow & Ball's incredible color palette for years and had the opportunity to drop in the downtown Chicago store the other day. 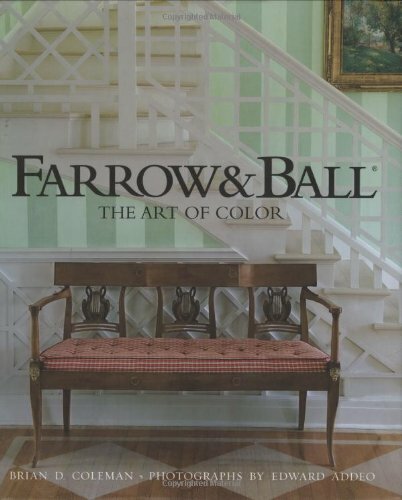 Have you peeked inside the yummy book FARROW & BALL The Art of Color (Gibbs Smith) ? It's a thing. of. beauty. Author Brian Coleman and photographer Edward Addeo lead us on a tour of castles, cottages, lofts, and more to demonstrate how paint color and wallpaper work magic in a variety of spaces. Don't miss the Farrow & Ball 'pale powder' and 'off white' kitchen on p. 138...the tile is to die for, and I keep the book permanently open to this page! Have a favorite go-to paint color you return to again and again?